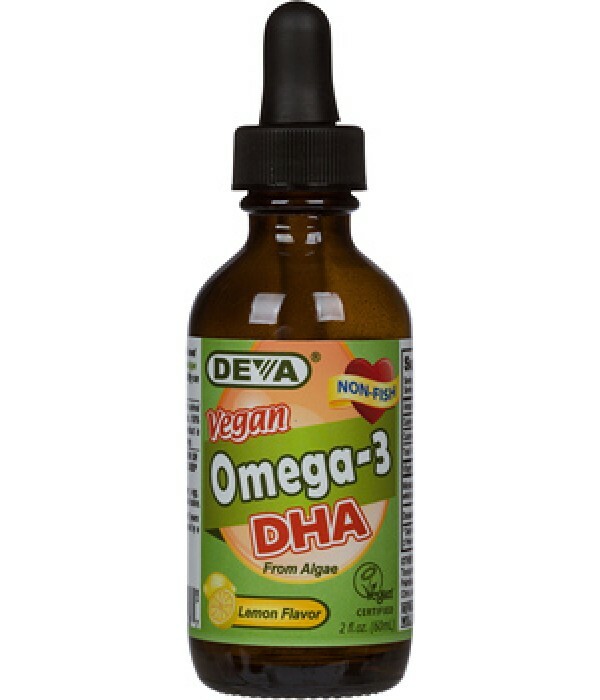 DHA is one of the prominent essential fatty acids in the brain and in the retina. 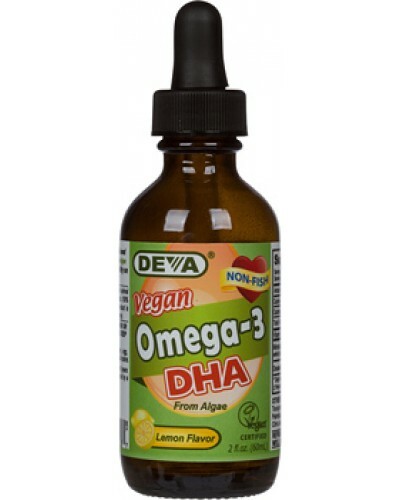 Our liquid DHA with fresh lemon flavor has an adult dose of 14 drops which provides 200 mg of algal DHA. Children dose is 7 drops. One very nice thing about this product is the fact that it can be mixed with food or smoothies as it is a liquid with no capsule. This could help people who have hard time swallowing capsules or children who cannot take capsules. DEVA Liquid DHA is 100% animal free, and guaranteed for purity, freshness and labeled potency. Remember all DEVA Products are 100% vegan, vegetarian and are registered by the Vegan Society, the non-profit organization that actually invented the word "vegan". *Lauritzen, L. et al. The essentiality of long chain n-3 fatty acids in relation to development and function of the brain and retina. Prog Lipid Res, 2001. 40:1-94. * Koletzko B, Lien E, Agostoni C, Bohles H, Campoy C, Cetin I, Decsi T, Dudenhausen JW, Dupont C, Forsyth S, Hoesli I, Holzgreve W, Lapillonne A, Putet G, Secher NJ, Symonds M, Szajewska H, Willatts P, Uauy R. The roles of long-chain polyunsaturated fatty acids in pregnancy, lactation and infancy: review of current knowledge and consensus recommendations. Journal of Perinatal Medicine. 2008;36(1):5-14. * Eilander A, Hundscheid DC, Osendarp SJ, Transler C, Zock PL. Effects of n-3 long chain polyunsaturated fatty acid supplementation on visual and cognitive development throughout childhood: A review of human studies. Prostaglandins, Leukotrienes and Essential Fatty Acids. 2007;76:189-203. * Specker, B. et al. Differences in fatty acid composition of human milk in vegetarian and nonvegetarian women: long-term effect of diet. J Pediatr Gastroent Nutr, 1987. 6:764-8. * Heude B, et al. Cognitive decline and fatty acid composition of erythrocyte membranes - The EVA Study. Am J Clin Nutr, 2003. * Salem N Jr, et al. Mechanisms of action of docosahexaenoic acid in the nervous system. Lipids, 2001. 36:945-59.